Synopsis: Eight guests and two servants are invited to an isolated island mansion and are targeted by a serial killer copying a grim nursery rhyme. Unable to leave and cut off from rescue by a storm, the guests must figure out which of them is the killer before there are no survivors. 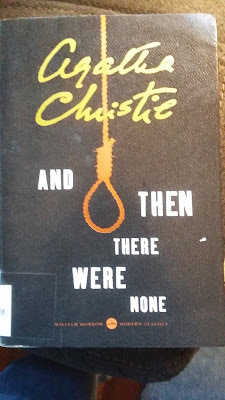 Review: I started reading this Agatha Christie novel some time ago. However, I had just finished watching a movie that was based off of the book and, since it wasn't as enjoyable when I already knew who the killer was, I gave up reading it after a couple chapters. However, while at the library a couple weeks ago, I came across the book again and, realizing I no longer remembered anything that happened in the film, decided to give it another try. This time, I finished the entire book and enjoyed every page of it. I've read quite a few Christie novels and this one is right at the top of my list of favorites. I can honestly say I think this is the perfect murder mystery. The thing that really won me over about this book was, unlike many other murder mysteries I've read (including quite a few from this author), there were absolutely no suspects that could be ruled out at any given time, unless, of course, they were murdered. Every time someone was killed, none of the remaining house guests had a solid alibi that would clear them. In addition, the murders were done in such a way, anyone of them could have pulled it off regardless of gender, size or age. I also loved how the book essentially pitted the guests against each other. Not only did this create some suspense, it also made the mystery considerably more difficult to solve because the lack of trust between the characters did help keep too many clues from being revealed. As a result of this, even though I did ultimately figure out the book's purposeful "red herring," largely because of very faint memories of the movie, I was truly stumped as to which of the guests was the killer until the confession at the very end. Heck, I even wound up staying up a lot later than expected just so I could find out who did it. And, I can't say that about a lot of books. Final Opinion: As I said before, this book could easily be described as the perfect murder mystery. I enjoyed every page of it and would highly recommend taking the time to read it (preferably before you see a movie version of it).